A new trend of sustainable energy and environmentally friendly power sources for both homes and enterprises is embracing more and more countries. Going green is now not only a concern of huge enterprises, which are responsible for great harmful emissions of chemicals and gases into the atmosphere, but now even medium and small companies, single entrepreneurs took on a good fashion of caring for our environment. Separate households are also eager to be a part of that prosperous and environmentally-responsible community. Therefore solar power and homes are becoming more and more interconnected, providing not only mutual benefits of helping our ecological system but also reducing personal utility bills which become higher with every coming year. Since one cannot live without electricity, solar power energy for home can become a great solution for your proper and distressful future. Sun is the ultimate renewable source of energy. You can use sun light to work for your own benefit in your home! You may be an eco-minded individual or financially concerned consumer, who is cautious about his current and future financial situation. The light from the sun is considered a sustainable energy that can provide resources, which are renewable in the future and have very low carbon footprints on our environment. Solar power and home can be a great mixture that would work together to provide you with reliable, long-lusting, proven photovoltaic panels, which will allow you to harness this alternative and free sun energy, and make it work for you. The biggest concern that may arise when you are aligning solar power and homes is the possibility of low-sun days. Sun-power is inconstant and changeable. However this shall not be the case for your worry. Solar energy can be easily stored at your home through the means of special collectors, traps and additional devices for your solar panels. Majority types of solar cells which are installed for household are able to store sun energy as a back-up for your home, since it is clear that sun doesn’t shine 24/7. Getting solar panels for your home is now very easy. Great distributors offer their products world-wide with considerable costs of shipping and installation. You may have heard about such companies as Mitsubishii, Q-cells, Evergreen, Sun Electronics, they and many other producers will offer you solar house systems ranging in price and efficiency. On average the cost per Watt of the solar power will turn out to be from $1 to maximum of $2 depending on how efficient are solar panels that you will choose. 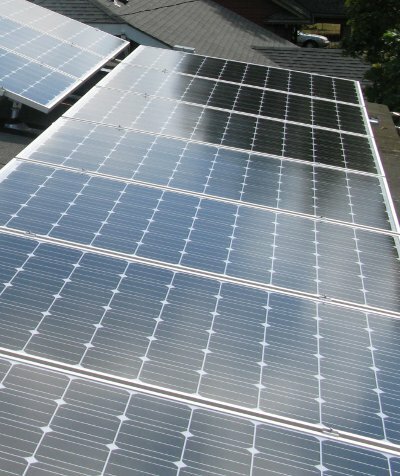 Solar panels for household are usually installed on roof-tops, other building-tops, or in special stand-alone facilities. It is also possible to install solar panels separate from your home, on a special setting unit that will also trace the rotation of sun during the day-time. Solar panel homes will perform at their optimum capacity when they are placed in the route of direct sunlight. Therefore it is better to position photovoltaic panel directly under the midday sun if you want to get the maximum efficiency from your solar power panel.